The Hanley fire surround is available in two finished American Walnut and Natural Oak Veneer. With its smooth lines and delicate styling the Hanely fireplace will look great in any room setting and with it's low energy down lights, it'll be sure to make a beautiful focal point to your living room. The Hanley is available in two sizes 48" and 54". 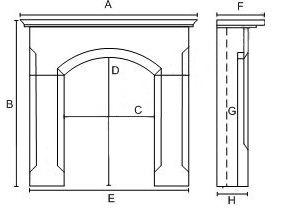 An optional Hearth and Back Panel are also available to purchase with the fire surround.